Born and raised in Chippewa Falls Wisconsin, we are a band of many tastes. We like everything from Black Label Society to the Grateful Dead. From Johnny Cash to Bob marley, from Black Sabbath to Eric Clapton. Beacon James is a melodic alternative folk n’ roll ensemble from Chippewa Falls, featuring tight female-fronted harmonies with drums, bass, keyboard, acoustic guitar and saxophone. This four-piece variety band from Durand plays cover tunes from Johnny Cash and Bryan Adams to Patsy Cline and Joan Jett, along with some originals. Great country covers from a group of musicians capable of high energy rock n’ roll stage performances and intimate, stripped-down acoustic sets. Big Deeks play a variety of music from the 50s to now, including some country, and also offer a DJ service during breaks. Bumblefist's motto is to “rock at random”, going from Bon Jovi to Seether to P!nk to Jackyl then round it out with selections from Heart, Buckcherry, Collective Soul, Journey, Ozzy, Katy Perry, Kings of Leon, Lita Ford, Kid Rock, No Doubt, The Offspring, Megadeath, Halestorm, Guns ‘n Roses, and many more. Featuring the amazing Sue Orfield on tenor saxophone, Randy Sinz on acoustic and electric bass and vocals, and singer/songwriter, Catya, on vocals and guitar, Catya’s Trio performs a mix of original and traditional Blues, Swing, Contemporary Acoustic music, and some other familiar and not so familiar stuff. The Commotion promotes a high energy, fun atmosphere that will make you want to jump out of your seats and let loose. Playing a variety of music starting back in the 60's, rocking and rolling all the way to today's hits including rock, country, pop, and blues music. From Alice in Chains to Zombie, Buckcherry to Velvet Revolver, 70s, 80s, 90,s and the 00s, Contingency plays your rock and roll favorites. Contradiction's influences are all over the map: from classic rock, current country, to blues, jazz, metal, and some popular 80’s bands as well. Playing around the Chippewa Valley since 2008, The Cragars are a group of dudes that play music to entertain even the most diverse crowds with oldies to newbies, rock, 90's rock, country and even some hip hop to keep everyone hopping. A group of 50-60 something gentlemen who play a wide variety of music spanning a longer time period than even the drummer has been living. The Cutaways draw from their extensive catalog to play anything country, classic rock, or folksy and bluegrassy. Divided Highway covers a wide variety of classic to modern rock and country, playing more than 100 shows a year. Features Iron Mike Shuttleworth on lead guitar, covering your favorites from the ’70s, ’80s and today. Classic rock, country rock, old rock and roll. 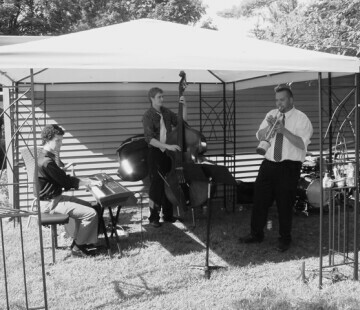 ECJ is happy to provide hassle-free live music for your next special event. This professional booking agency is a reliable source for live music. They hand-pick top regional musicians to create an ensemble that is specifically catered to your needs. Freddy Sklenar plays flawless jazz standards while understanding what their audience wants to hear. The HGT Band (Home Grown Tomatoes), is a professional band with an extensive musical repertoire and an experienced history. Will play for any ages with oldies like doo-wop and Elvis. Howard “Guitar” Luedtke and wife Deb Klossner on bass, Blue Max has been perfoming since its formation in 1982. With the combination of talented slide guitar playing with a genuine, old-fashioned passion for the music, you’ve got a versatile groove that both young and old can appreciate. The Jayson Collins Sextet is a high-energy jazz group playing through a mix of joyful and eclectic original tunes. The band is fronted by trumpet, alto and tenor saxophones, and is supported by piano, bass and drums.